The EFFACE project - short for "European Union Action to Fight Environmental Crime" - was a 40-month EU funded research project running from September 2012 through March 2016. Eleven European research institutions and think tanks were involved. 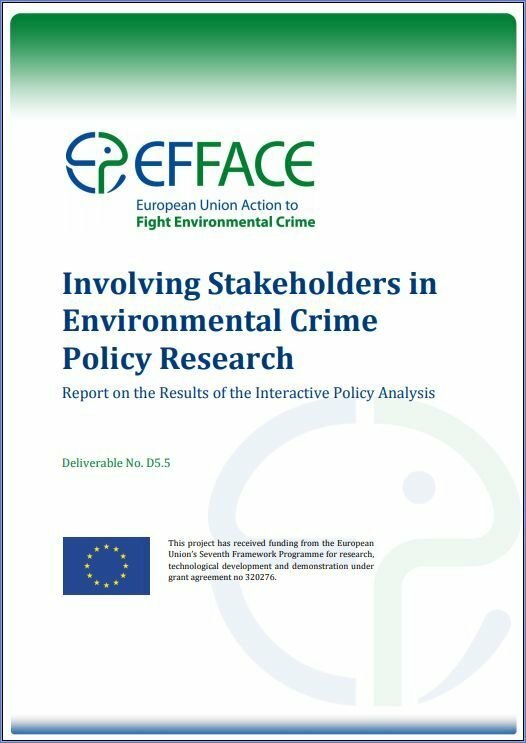 EFFACE assessed the impacts of environmental crime as well as effective and feasible policy options for combating it from an interdisciplinary perspective, with a focus on the EU. EDRC's Executive Director served as the IES coordinator for the EFFACE project. He was the author of Involving Stakeholders in Environmental Crime Policy Research. This report provides an account of how stakeholders are involved in an "Interactive Policy Analysis" to generate input, feedback and mutual learning with and among stakeholders. This effort is directly linked to the project's action on "Stakeholder Involvement and Dissemination", which aims to draw on relevant expert and stakeholder knowledge and insights as a way of informing research activities and road testing results. Through this process, awareness is fostered and the potential for the intended project results are increased by effectively disseminating the project's research results in the policy, scientific and wider stakeholder community. An edited volume, Fighting Environmental Crime in Europe and Beyond: The Role of the EU and Its Member States, was published by Palgrave Macmillan in March 2017 following the conclusion of the EFFACE project. The edited volume summarizes research undertaken in EFFACE and consists of six case studies conducted during the project on different types of environmental crime. Following the EFFACE project, a second edited volume focused on legal matters, titled, Environmental Crime in Europe and was published by Hart Publishing in the series Modern Studies in European Law. More information about these and other publications and about the project are available on the EFFACE website.